These aqua beads have two glass jewels, a sparkling aqua round “rivoli” jewel (the faceting comes to a point rather than being “table cut”) – and a tiny sparkling rhinestone chaton. They’re a fine example of simple, easy to use, and beautiful. You really don’t need to do a bunch of Stuff to have a lovely pair of earrings. 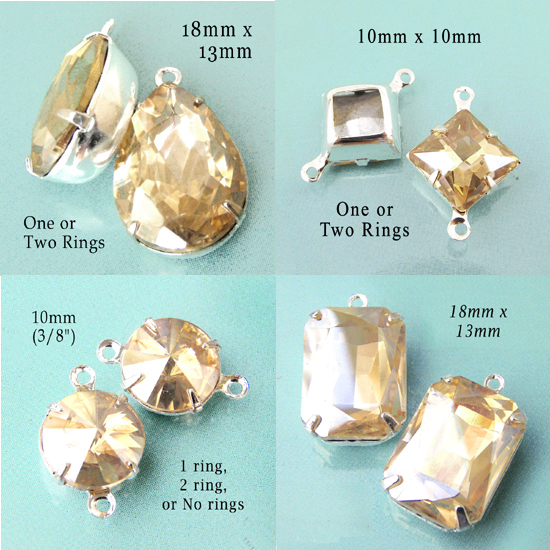 They’re about 3/4″ long, large enough to have “presence” – and to add color and sparkle to your outfit. But they’re not big and heavy. It’s easy to use them – just add earwires (or leverbacks, my favorite). But you could also dangle them from other crystals, from jeweled links, from wire-wrapped pearls. Make them into long dangles if you like. Still: used exactly “as is” (whether in the patina brass settings shown, or golden raw brass, or shining silver plate) – they’re lovely earrings. Perfect for your bridesmaid – or your bridal earrings. Perfect for gifts. Perfect for you. This is what easy DIY is about. Perfect for you. The color known in the jewelry trade as ‘light colorado topaz’ is a wonderful golden tan, not too dark, that is totally reminiscent of champagne. Or the color we think of as “champagne”. Or a rich beautiful sparkling mysterious light lovely topaz. These are just a few of the shapes I have in my Etsy jewelry supplies shop in this lovely color. It’s so flattering (not too yellow-greenish, not too washed-out beige) and easy to wear. It looks rich (i.e., reference to ‘champagne’ I mentioned earlier). It’s great for bridesmaids – and brides. 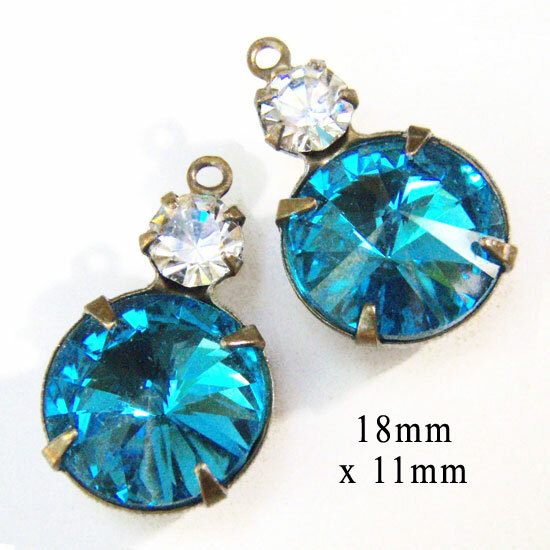 And if you stretch a bit, it’s even the birthstone color for November (topaz). It’s basically just a baseball jacket. It’s casual, it’s not meant to be Grand, it’s probably fairly lightweight. Perfect for fall days or nights when you just need a little something. The thing is, somebody decided to make it fun. 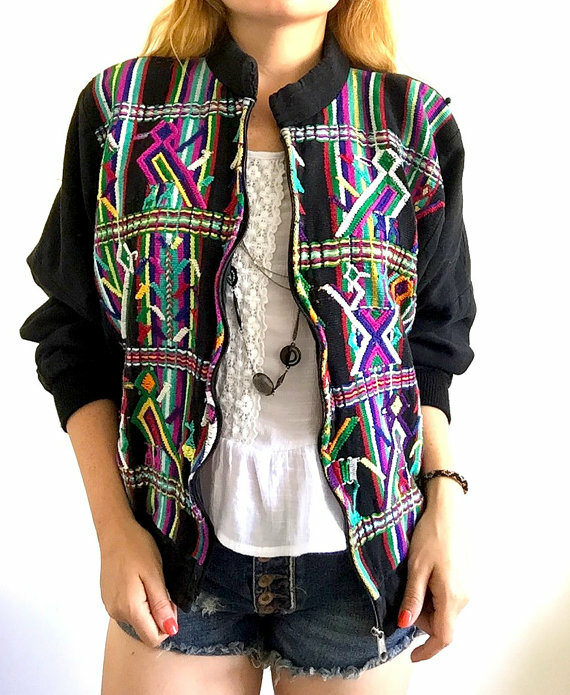 It’s hand-embroidered, it’s got lots of colors, it’s not super expensive, and you’re definitely not going to see a bunch of them running around the neighborhood.